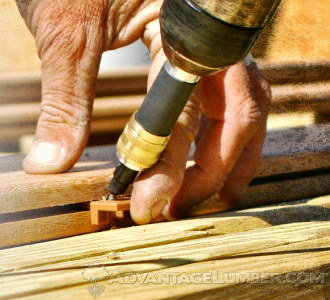 Predrilling is an important step when it comes to fastening hardwoods. Predrilling is a must on any hardwood, but especially for Ipe. If you were to try to install screws – no matter what kind – without any predrilling, you’d quickly find that a lot of torque and pressure needs to be applied in order for the screw to fasten. Applying this much pressure and torque will wear out your tools, and possibly break the screws. Fortunately, there is a faster way to predrill and insert the screws, and that is with the DeckWise Drill & Drive kit. This quick release tool allows you to go from a drilling and counter sinking tip to a screw tip in a matter of seconds without having to unlock and lock the drill chuck constantly. Using the right saw blade helps you get the most out of your tools. Cutting Ipe presents another problem. 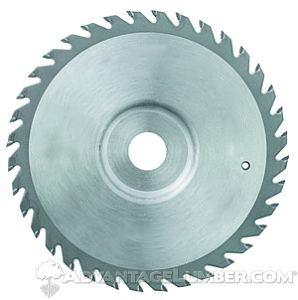 The strength and density of the wood makes regular blades dull out within a few cuts. For this reason, it’s always best to use carbide tip blades to ensure that each cut can be done smoothly and quickly many times over. Each carbide tip blade or drill bit is typically a dollar or two more expensive than the regular variety. When working with Ipe it’s a wise decision to spend a little extra money and save you the headaches of having to change dull blades often. Finally, let’s address the issue of price. Ipe is a very expensive wood. Usually you’ll find yourself spending about $3.00 – $4.00 per lineal foot of for 1×6 material. With wood, the old saying “you get what you pay for” definitely stands true. Cheap woods like pressure treated pine can’t last very long under the tough conditions decking boards have to endure. The sunlight quickly deteriorates pressure treated pine causing it to splinter and crack as it grays out. Although pressure treated pine is resistant to termites, it develops mold like any other softwood and lasts only around 10 years with constant sanding, sealing and staining. Ipe is almost the complete opposite. Ipe is highly resistant to termites and mold without the added chemicals that pressure treated lumber has. Ipe can last over 50 years if left untreated, and as it grays out its strength, resistance, and density remain unchanged. To maintain its color just add a finish for hardwood decking like Ipe Oil™ or Messmer’s UV Plus once a year or as you see fit. That’s it. That’s all Ipe needs. This is the reason why Ipe’s initial cost is so high: once installed, there’s no maintenance needed aside from a regular sweep and wash. It is our hope that you found responses to the most common problems that are linked to Ipe. This way you can make the best decision based on facts. This entry was posted in Decking Installation, Exotic Hardwood, Ipe Decking, Ipe Wood and tagged ipe problems on January 8, 2014 by Mr. Ipe Hardwood. I will forward your request to one of our sales persons who will be in touch with you via email.